Getting lost or left behind at sea is probably one of the scariest situations a diver can find himself in. Being alone at the surface in the middle of the ocean is something you do not want to experience. Fortunately, it does not happen often and with a little knowledge and reparation you can reduce the possibility in getting lost to a minimum. Why would divers get lost? I am Lost… What Now? Remember that you might be able to see the boat or shore, but your friends or dive crew might not be able to see you. The reason is very simple: you are just a tiny dot at the surface of the sea! What will be sticking out of the water would be your head and shoulders. So, what you need to do is increase your visibility and use equipment to attract attention. Studies have shown that fluorescent green (green-yellow) and fluorescent orange are the most visible colors. These as well as bright yellow, green and orange will increase your visibility and safety. The more contrast between you and the surface of the sea, the easier it becomes to be spotted. The use of (SOLAS) reflectors also increase visibility and some manufacturers already have reflector stripes incorporated in BCDs, diving hoods or dive suits. The use of an SMB is not only to show to boaters you are diving, but is also a way dive crew can follow you at the surface. The limitation however is the size. It just doesn’t stick out of the surface much to be visible over a long distance. 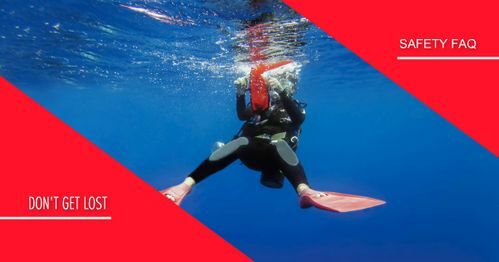 A delayed SMB is mostly used during safety stops to show the diver’s position. They are inflated at depth or at the surface and will stick out of the water much more than a standard SMB. They normally also have brighter colours and some even have reflectors on them and/or have an incorporated attachment for strobe lights, light sticks or similar lighting devices. A small number of available delayed SMBs even have a small safety kit inside with for example a whistle, light stick or signalling mirror. This is a small mirror used to reflect the sunlight and attract attention of persons on a boat, shore and even in an airplane or helicopter. These materials will become very useful at night and can be used at the surface to show the diver’s position. This continuous visual surface signalling equipment is especially useful when search operations are done from the air. The Streamer will increase the size of the diver thanks to the long and wide bright orange, high-density polyethylene foil. From the air, it can be seen up to a 2km distance. The Rescue Streamer is available in different sizes and, for increased visibility, some versions have SOLAS grade reflectors and are equipped with Chemical lights, making them also useful at night. A whistle can carry the sound over a longer distance than a human voice (even when shouting) and makes it much more possible to be heard. It is recommended to use a pealess whistle as these whistles are much louder. This type of acoustic device makes more noise than a whistle but it needs the air from a dive cylinder in order to work. There are several types of air horns on the market and are to be connected between the inflator hose and inflator of a BCD. Marine VHF radios are used for standard communication between boats, but you normally need a VHF radio license to operate one. Normal VHF radios without special housing are not ready to dive with. Only the Nautilus Lifeline™ has a special pressure and water-resistant housing and additionally incorporates a distress button to send your coordinates to other boats. Obviously the counterpart needs a radio too and, as with all radio-frequencies, there is a limitation in distance. Disadvantage for this device: it needs an MMSI number, which in many countries is only given to ships. Another option is the use of a Satellite phone, but you will need an underwater housing for it. You can practically call anyone in the world with it and satellite technology makes it possible to determine the approximate position of the user. The ENOS®-System runs self-contained and self-dependent and does not depend on the aid of other rescue institutions and services. It consists of a receiver (aboard the dive boat) and one or more transmitters (carried by the divers). In case of need, the ENOS®-Transmitters have to be switched on by the diver. The diver’s position (GPS) will be transmitted to the receiver by a license-free radio-frequency. The position of the ENOS®-Transmitter, its distance and direction towards the receiver, are shown on the display of the receiver. A PLB alerts search and rescue services by transmitting a coded message (406 MHz) via the COSPAS-SARSAT global satellite system, to the nearest rescue co-ordination centre. If the PLB also has a built-in GPS it enables rescue services to accurately locate a diver to +/- 60 m. Once in the area, rescue services are then able to find the diver’s exact location using the inbuilt 121.5 Mhz homing transmitter. PLBs are subscription-free devices but need to be registered to a person. Most PLBs though are normally not designed to dive with and only few manufacturers offer an underwater housing or have water/pressure resistant PLBs. Other similar tracking devices are available but require an annual subscription to private companies or are limited to the 121.5Mhz frequency and/or GPS technology, making it less interesting compared to real PLBs.